Raw and living food, when consumed appropriately, can be immensely beneficial to your overall health. Consuming a diet high in raw and living food also supports the health of the planet. 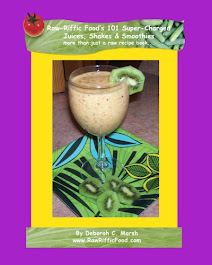 A diet high in raw and living food can contribute to super health, looking younger, feeling happier, and living longer. 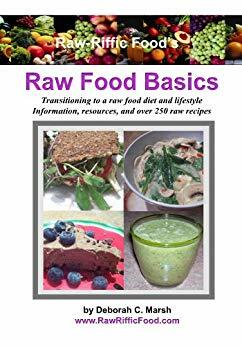 What is considered raw food? Raw food is any raw or living food that has not been heated above 116°F. Overheating can destroy necessary enzymes in raw and living food. Cooking food changes the molecular structure of the food which could render it toxic. Most raw and living food has an enormously higher nutrient value than food that has been cooked. Raw food IS NOT food that has been canned, bottled, or prepackaged and processed with added refined sugars, salts, and chemical additives. Raw and living foods include raw fruits, vegetables, sea vegetables, seeds, nuts, and even sprouted whole grains. (Some raw food diets even include certain meats, fish, eggs, raw milk, cheese, and yogurt). Most raw diets are predominately vegan - no meat or dairy. Plant life is good for you! Plants contain Phytonutrients that keep the body healthy and help fight off disease. Phytonutrients are considered life’s natural vitamins. Phytonutrients help to repair damaged cells and build up our immune system. A large number of Phytonutrients are actually Antioxidants. Antioxidants slow the aging process in both the body and the brain. The most common Antioxidants include a variety of Enzymes, Vitamin C, Vitamin E, and Beta Carotene. Plants contain Chlorophyll, which that is present in plants as a green pigment, and helps to absorb sunlight. It uses its energy to synthesize carbohydrates from Carbon Dioxide and water; otherwise known as Photosynthesis, the basis for sustaining the life processes of all plants. Chlorophyll is more abundant in leafy vegetables – especially dark green leafy vegetables. Chlorophyll is known to have antioxidant activity. Living plant foods such as fruit and vegetables contain a much higher level of enzymes than raw foods. However, raw foods, such as un-sprouted nuts, contain enzymes that are dormant. Nuts must be soaked in order to activate the enzymes within them, to be considered “living” food. Why living and raw food? The human body does not produce vitamins, which must be absorbed in order to benefit from the nutrients, to feed the cells, in order to live. Humans are dependent on eating things that have vitamins in them, such as living plants and animals, or supplements. Vitamins activate enzymes – enzymes are needed for our bodies to function and live. Enzymes aid in digestion, absorbing and converting food into body tissue. Enzymes create energy at the cellular level and are critical for most of the metabolic activities that take place in the body each and every second of the day. Enzymes are known as the “living energy” of food. Enzyme rich food helps our bodies to get the maximum utilization of the food we eat, preventing illness and weight gain. Cooking denatures the proteins and enzymes. Most raw and living foods have the highest content of enzymes. Most conventional produce is grown using pesticides, herbicides, synthetic fertilizers, and a variety of other harmful substances. It is impossible to “wash” off these harmful toxins from conventional produce, since the produce absorbs these substances as it matures. Organic produce is grown without these harmful toxins, making organic produce more nutritious, with a lot more flavor. Not all "organically" grown produce is certified organic, as this certification is very expensive. It's best to know the source in which the food was grown to truly gauge its safety and quality. Not all organic produce is create equal. Depending upon where the produce was sources, and what precautions were taken for its transport to the store, could greatly affect the quality. If possible, grow your own food in rich nutritious soil. Are some raw foods better than others? Most of a raw food diet should consist of fresh raw fruit and vegetables, including sea vegetables; with special attention made to dark leafy green vegetables. Nuts, seeds, and the like should be secondary in the diet. (Be sure to check yourself for nut sensitivities before consuming). Green veggies have 20-50% of the calories from protein, which is the highest and purest form of protein you can eat. The darker the green, the better! The more greens in the diet, the more benefit the body gets! Some fruits and vegetables cannot be eaten raw as they are hard on the digestion, or even poisonous. Always do your research before experimenting with unfamiliar living and raw foods. Eating dark leafy greens is vital to your overall health and well-being. Without eating a large percentage of dark leafy greens on a daily basis, your body would lack in receiving the very life-source which heals and regenerates all parts and functions of your body. Dark leafy greens are vitamin rich, containing high sources of vitamin A, C, and calcium, carotenoids, flavonoids, sulphur an indoles. They also contain sulphoraphane and genistein which are known for fighting cancer. Dark leafy greens are also a great source of fiber. They are particularly rich in antioxidants due to their high levels of chlorophyll. Chlorophyll is what gives green plants their color – so dark leafy greens are chlorophyll-rich! Chlorophyll has been proven to assist in the production of red blood cells. These leafy greens are known for their prevention of diseases, including heart disease, stroke, a variety of cancers, blood pressure, digestive issues, to name a few. A good tip to remember, “the darker the leaves, the more nutrient-rich the vegetable” – that’s why dark leafy greens are KING! Dark leafy greens are rich in vitamin K making them an excellent source for bone health. They also contain high amounts of quality proteins. They are a better source of vitamin C than oranges, and a better source of vitamin A than carrots. And most importantly, they provide essential alkaline minerals such as calcium and magnesium. You get more nutrition, more life force per calorie of a dark leafy green, than you do any other plant or animal source available. Not all greens are created equal! It is important to know how to consume certain greens, as it can impact your health greatly. Certain greens must be cooked to help with thryoid function, and some need to be cooked to protect you from developing kidney stones. Most greens are actually easier on your digestion when combined with quality fat. However the greens need to be prepared, they need to be eaten. The body can't thrive without them!